WILLEMSTAD - On Tuesday, March 28, U.S. Consul General Margaret Hawthorne organized a panel discussion at Roosevelt House to highlight the social, economic, cultural, and political achievements of women. After all, the world celebrated International Women’s Day on March 8, which was the day that also marked a call to action for accelerating gender parity. The panel members, Consul General Hawthorne, Member of Parliament Giselle McWilliam, SEDA President Myrtha Leetz Cijntje, Nos Pais CEO Mavis Albertina, RST Chief Martine Vis, and President of Pantalla Chica Productions Sulin Passial addressed some of the following questions: How have successful women in Curaçao addressed challenges? What were your challenges in your quest to reach your current position? What can be done to address these issues in the future? 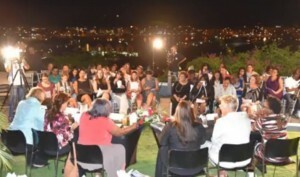 The invited guests, part of an entire female setting, were Minister of Traffic, Transport, and Urban Planning Ruthmilda Larmonie-Cecilia, former Prime Minister Emily de Jongh-Elhage, entrepreneurs, students, and others interested in this topic. The general consensus was that the Dutch Caribbean has a history of Pal’i Muhé (strong women) in leadership positions, but there is still gender inequality and a continuous need for women empowerment. They pointed to several causes, such as unconscious bias among managers; lack of female role models; lack of qualified incoming talent; women’s confidence, aspirations; lack of work-life balance.